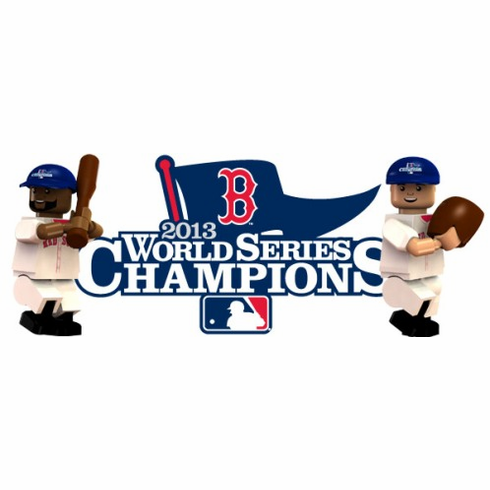 Jonny Gomes - Boston Red Sox Special Edition 2013 World Series Champions OYO Mini Figure! Part of the Generation 2 World Series Champs collection. This will surely be a collector's item. Don't miss out! Special �World Series Champions 2013� Packaging includes 2013 World Series Champs artwork on the front and back of the Oyo package. Each player will have the patch logo on their cap as well to show that they played in the World Series. Each OYO comes with their own stand, which lets you position and pose your OYO for display on any flat surface. Or, snap your stand onto a building block grid and build your own scenes! OYOs play nicely with other toys! OYOs are compatible with other name brand building blocks, so your OYOs can become part of your favorite scene. We encourage you to build and play!